The Rest and Be Thankful hillclimb organised by the RSAC. Homepage. This page: Items of paperwork relating to the RSAC's speed hillclimb in the 1950s. Rest and Be Thankful speed hillclimb. 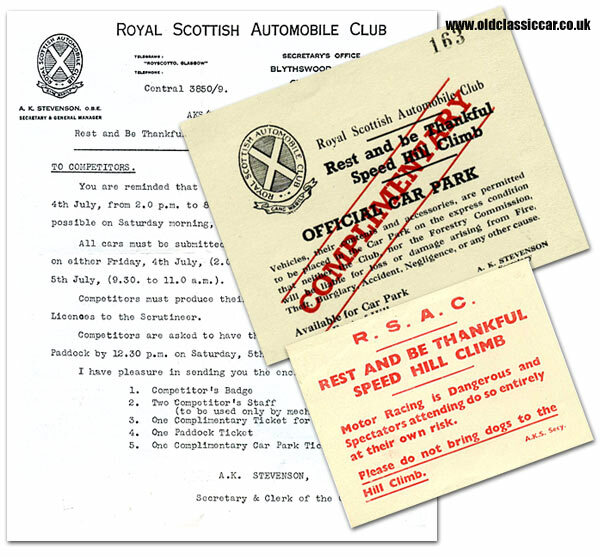 The Royal Scottish Automobile Club (RSAC) organised the speed hillclimb meeting at the Rest and Be Thankful in Scotland. As I'm always on the look-out for items relating to sprint and/or hillclimb meetings held in the UK between 1946 and 1955, these items of paperwork were soon bought. They date to 1952, and would have been sent to an entrant/driver for the July '52 hill climb meeting, one of several gatherings at this northern venue that my old transporter would have attended with a '30s Grand Prix Alfa in the back (hence my interest). The letter to competitors reminds them that Practice was due to take place on Friday 4th July, from 2pm to 8pm, with none occurring on Saturday 5th July. Scrutineering though could take place either on the Friday or else Saturday morning, prior to the timed runs commencing at 2pm. Drivers were reminded that they'd need to have their FIA Competition Licence to hand on arrival, and that their cars needed to be in the Start Paddock by no later than 12.30pm on Saturday. Accompanying the letter is a note reminding spectators of the dangers of motor sport in general, and also a complimentary car park pass. A large paddock pass, printed on pink paper with a gummed reverse side, would have been attached to the windscreen of the competitor's race transporter, or their tow-car. Needless to say, if anyone else reading this has similar items for sale, or at least available to scan, I'd be interested to hear from you. In 1949 regular annual speed hillclimbs at his venue would commence in earnest, continuing until the final headline event in 1969. Since then, various clubs have had low-key meets at The Rest, but nothing on the scale seen in the 1950s and 1960s. There are plans underway to try and restore the surface of the track and re-launch speed meetings at The Rest, so hopefully ERAs and other spectacular racing cars will return to the hill in the not-too-distant-future. More information on these plans can be seen on the Friends of The Rest website. The DVD that they sell, featuring meetings in the early 1950s, is definitely worth buying if post-war hillclimbs are your thing. More items relating to cars in general can be found in the Motoring Collectables section, while pages related to motorsport in particular can be found here.